Annuities have been called “complex” by some. (NOT!) Actually, when you’ve got the lowdown on these retirement savings products, it’s pretty simple! *wink* Now- let’s assume that you don’t know what an annuity is. No worries. Most everyone knows what life insurance is, so let’s just start by making a comparison to life insurance. With an annuity, the purchaser pays a premium to the insurance company. In exchange, they receive a regular stream of income payments from the insurer that begin either immediately, or at some time in the future. The payment stream continues until the purchaser dies- even if that occurs at age 127 ½! Heads up- an annuity is one of tons of financial products that are available as a retirement income vehicle. You should work with a trustworthy professional when determining which of these vehicles best-suits your needs and retirement goals. Got it? In light of this fabulous tradeoff, there are three questions that must be answered, when researching what type of annuity is right for you. 1. What level of risk am I willing to assume with the annuity? 2. How soon will I need the regular stream of income payments from the annuity? 3. How many premium payments will I be making into the annuity? There are also two different classifications of annuities: deferred and immediate. Deferred annuities typically are used as vehicles for accumulation, or building additional interest until the annuitant is ready to transition the annuity to a series of payments through a process called “annuitization.” Alternatively, an immediate annuity is often used as a vehicle for individuals who are ready for their income stream to begin, well, immediately. Indexed Annuities provide limited gain potential and are not intended to perform comparably to securities products. Indexed Annuities merely credit interest based on the performance of stock market, commodities, or bond index. Don’t be confused; these annuities do not allow you to invest directly in the stock market. They do, however, provide the opportunity to outpace fixed money instruments such as Certificates of Deposit (CDs) or Fixed Annuities. A contract issued by an insurance company that guarantees a minimum interest rate with a stated rate of excess interest credited, which is determined by the performance of the insurer’s general account. Multi-Year Guaranteed Annuities (MYGAs), a type of Fixed Annuity, guarantee a minimum interest rate for more than a one-year period; this rate is also determined by the performance of the insurer’s general account. A Fixed Annuity is considered a low risk/low return annuity product. So, let’s consider an example, using Fixed Annuities as a point-of-reference. The insurance company then credits [4.00% – X] to the annuity purchaser’s 10-year fixed annuity contract [the value of X is determined by knowing what amount the insurer needs to cover their expenses (i.e. salesperson’s compensation) and the amount of profit the insurance company intends to keep]. Ta da! It’s that simple! Now, with Indexed Annuities, the example above is only modified slightly. The determinant in the rate that is credited to the annuity is: a) the cost of the option, and b) the stock market index’s performance. So, we have established that there are several different types of annuities, the primary categories being Fixed and Variable. These products are very different, despite the fact that they both may be used for the same purpose. Not everyone has similar tastes after all (hence the exhaustive list of delicacies available at The Cheesecake Factory!). Okay- so we’ve seen some of the likenesses in these products. So, what’s different? Even though Indexed Annuities earn interest based on the performance of a stock market or similar index, a securities license is not required to sell Indexed Annuities. They are fixed insurance products; the annuity purchaser is never directly invested in the stock index with an Indexed Annuity. Fixed, Indexed, and Multi-Year Guaranteed Annuities, like other insurance products, are sold via an insurance contract. This document is 20 pages, give or take. By contrast, securities products (such as Variable Annuities) are sold via a prospectus; a document that is typically more than 100 pages. The fact of the matter is, if most American’s don’t read their mortgage paperwork, they’re not going to read these documents either. Sad and scary, but true. So, the insurance company holds the risk with a Fixed Annuity. The insurer still has to make good on the minimum guarantees in the contract, regardless of the performance of their own investments. So, the insurance company holds the risk with an Indexed Annuity. The insurer still has to make good on the minimum guarantees in the contract, regardless of the performance of their own investments. So, the annuity purchaser holds the risk with a Variable Annuity. The insurer has no minimum guarantees to honor in the contract (they collect their fees and charges regardless of performance), and any negative performance on the underlying investments is fully-realized by the annuity purchaser. Heads up before you get deep into this regulation stuff- all financial services products have been used in the course of bad behavior, on the part of the salesperson, at one point or another. It is worth mentioning that the tool of the bad behavior is not the problem in such situations. I liken this to a serial killer using a hammer to murder his victim and the government subsequently outlawing the use of hammers. That would make it difficult to complete tasks such as building homes and hanging pictures, but it would certainly eliminate people bludgeoning their victims with the tool. That being said, keep reading- you are doing GREAT! Who regulates annuities? Is someone keeping tabs on these folks? Fixed, Indexed, and Multi-Year Guaranteed Annuities (MYGAs) are fixed insurance products, and therefore regulated by state insurance laws and the insurance commissioners that enforce them. Insurance companies, salespeople, and annuity purchasers go through their local state insurance department when they have questions or concerns about Fixed, Indexed, or MYG Annuities. Variable Annuities are securities products, and thereby regulated by the Securities and Exchange Commission (SEC). However- insurance companies, salespeople, and annuity purchasers go through the SEC when they have questions or concerns about Variable Annuities. In the securities industry (where products such as Variable Annuities are sold), salespeople that are licensed to sell the products are regulated by the Financial Industry Regulatory Authority (FINRA) as opposed to the state insurance commissioner. In a nutshell, if you hold securities license, you must abide by the rules of the FINRA as well as the SEC, while the insurance commissioner oversees the solvency of the insurance companies you do business with. Note that in the past, there have been a handful of Fixed and Indexed Annuities that have been filed as securities products and registered with the SEC, despite the fact that they are fixed insurance products. An insurance company’s logic behind doing this may be for several reasons. One reason an insurance company may register a fixed product as a security is to accommodate a distribution that is used to selling securities products (and the prospectuses that come with them). As a comparison, historical sales of registered Indexed Annuities have been nominal in comparison to total Indexed Annuity sales. Today, there are no registered Indexed Annuity products available for sale. Both fixed and variable insurance products have tight regulation, and rules that the insurance companies and salespeople must abide by. The insurance company’s products, advertising materials, disclosures and training brochures are diligently reviewed in both the fixed and variable insurance markets. Salespeople are required to be properly licensed to sell both types of products. The market conduct of the marketing organization, broker/dealer, and salesperson are all carefully monitored, whether she/he is selling the Fixed, Indexed, or Variable variety of annuity. Click here for a detailed timeline of the SEC’s efforts to regulate Indexed Annuities as securities products. In 1997, just two years after Indexed Annuities were introduced, the SEC first explored whether these products should be treated as securities (and subject to SEC regulation), as opposed to being treated as insurance (and therefore regulated by the NAIC). the annuity was not marketed primarily as an investment. For these reason, it was believed that Indexed Annuities were fixed insurance products, not securities- particularly when the SEC took no action in 1997. Therefore, B/Ds began the task of overseeing Indexed Annuity sales for their registered representatives in August of 2005, and still oversee them to this day. One of the primary reasons that Indexed Annuities have received negative media attention is because of their perceived complexity. Adding fuel to the media fire is that fact that some annuity salespeople have used Indexed Annuities in the course of bad behavior. These individuals’ suggestions of unsuitable annuity products resulted in some annuity purchasers being taken advantage of. Overall, this resulted in observers making the inaccurate assumption that all Indexed Annuities are “bad,” or used to take advantage of seniors. After a two-year battle waged with regulators, litigators, and legislators, the insurance industry secured the fixed insurance status of Indexed Annuities indefinitely. In July of 2010, President Barack Obama’s signed the Dodd-Frank Wall Street Reform and Consumer Protection Act, which contained Senator Tom Harkin’s (D-IA) Congressional amendment detailing and dictating Indexed Annuities’ permanent insurance regulation. Now you should understand what an annuity is, who can sell them, and who regulates them. You should also understand quite clearly, what an annuity is not. Fixed, Indexed, and MYG Annuities are not alternatives to Variable Annuities, stocks, bonds, or mutual funds; these products are “risk money places.” Fixed, Indexed, and MYG Annuities are more accurately classified as “safe money places,” and generally viewed as an alternative to CDs, or other fixed-rate savings instruments. Is an annuity right for you? Only YOU can decide. Fixed Annuities have an interest rate that is declared annually by the insurance company. Multi-Year Guaranteed Annuities are like traditional Fixed Annuities in that their interest rate is also declared by the insurance company. However, Multi-Year Guaranteed Annuities’ interest rates are guaranteed for longer than a one-year period. Guarantee periods on these annuities may range anywhere from two to ten years. Most Indexed Annuities today offer some form of fixed bucket strategy. This would be a premium allocation option that receives credited interest in a manner like that of a traditional Fixed Annuity. A declared rate is set for the fixed strategy, and the annuity purchaser receives that rate if the annuity is held for the strategy term (usually one year). Most Variable Annuities also offer a fixed bucket for clients desiring a more conservative allocation mix. However, the line between Fixed, Indexed, and Variable is drawn when it comes to differentiating how the non-guaranteed rates are credited on these products. Remember that with a Fixed Annuity, the insurance company declares a stated credited rate for the non-guaranteed, current interest rate. A Variable Annuity is very different in that the insurance company does not limit the potential gains of the product; the client is investing directly in the market. Therefore, a Variable Annuity purchaser may realize a gain of 18.00% if the fund they invested in grows that much over a one-year period. With an Indexed Annuity, the insurance company purchases options based on an external index’s performance, and the annuity purchaser receives non-guaranteed, current interest that is limited in growth (based on the option price). Now that all of the disclaimers are aside, it can simply be said that most indexed strategies that have 100% Participation utilize a Cap as the pricing lever. In turn, most indexed strategies that have less than 100% Participation utilize the Participation Rate as the pricing lever. There are also trends among indexed crediting methods; averaging strategies tend not to have Caps more often than others, and utilize Spreads more frequently. Annual point-to-point methods generally utilize the Participation Rate or a Cap to limit potential indexed gains. Typically, an Indexed Annuity utilizes only one pricing lever on each strategy. This means that when the insurance company changes the annuity’s rates, or the contract comes upon the policy renewal, only the one pricing lever will be adjusted upward or downward. However, an insurance company may reserve the right to adjust more than one pricing lever in the event of declining rates. This does not necessarily mean that they alter more than one pricing lever by practice. Generally, the less “moving parts,” the easier the product is to convey to both the salesperson and the purchaser. For that purpose, insurance companies try to limit the number of variables needed to describe each crediting method. It is important to note that there are a handful of products that use a moving part that is unique specifically to that product. These are just other pricing levers where potential interest crediting has been limited. Indexed Annuities are also like Fixed Annuities in that they have minimum guarantees to protect the purchaser from a downturn in current credited rates or Caps, etc. Fixed and Multi-Year Guaranteed Annuities generally offer a minimum guaranteed floor of 1.00% or more. Indexed Annuities offer a guaranteed floor of no less than 0.00%. In addition, Indexed Annuities have a secondary guarantee that is payable in the event of death, surrender, or if the external index does not perform. This secondary guarantee is referred to as a Minimum Guaranteed Surrender Value (MGSV); it credits a rate of interest between 1% and 3% on a percentage of the premiums paid in to the annuity. MGSVs can be stated in two methods: as Account Value guarantees, which must deduct the surrender charges from the calculation, or as Surrender Value guarantees, which are net of the surrender charges on the contract. An Indexed Annuity with a first-year surrender charge of 10%, and an Account Value guarantee of 100% @ 3% may be equivalent to the Surrender Value guarantee of a second product with an MGSV of 90% @ 3%. (100% – 10% surrender charge = 90%). When Indexed Annuities first emerged in 1997, their MGSVs were often based on 90% of premium, credited at 3% interest; i.e. 90% @ 3%. However, when market conditions began declining and insurance companies weren’t able to offer indexed products with these guarantees, we saw MGSVs drop as low as 65% @ 3% for first-year premiums. It is important to note that annuity MGSVs most adhere to state Standard Non-Forfeiture Laws (SNFL), which are enforced by the state insurance departments. Today, more than three quarters of Indexed Annuity products have MGSVs that are based on 87.5% of premiums, and credited interest is based on the 5-year Constant Maturity Treasury rate (a rate between 1 – 3%). 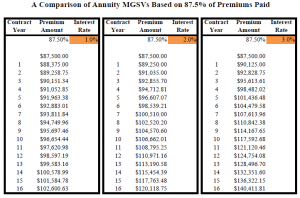 Today, annuity MGSVs cannot be less than 87.5% of premiums paid, credited at 1% interest. Another very important rate to consider when evaluating which product to purchase, whether Fixed or Indexed, is the renewal rates. These are the new interest crediting rates, Caps, Participation Rates, etc. that are declared at the end of the interest crediting term (typically one year). So many products today are copied off of another popular insurance company’s product. If you want to evaluate the annuity beyond the contractual features, and the service and integrity of the insurance company; renewal rates should be taken into consideration. That being said, renewal rates are one of the most difficult pieces of information to get your hands on. A scant number of insurance companies feel that their renewal rates are an integral part of their sales story, and actually publish marketing pieces publishing these rates. This gives the potential annuity purchaser an idea of what the insurance company may do to the future rates on the product that they purchase, based on past renewal rate histories. If you do not have access to renewal rates, it may be helpful to research Fixed and Multi-Year Guaranteed Annuities’ minimum guarantees and an Indexed Annuity’s minimum Participation Rates and Caps, as well as their maximum Spreads. These can be an indicator of just how low the insurance company could reduce the rates on the product after it is purchased. Note however, that due to policy filing efficiencies, many insurance companies opt for unusually low rate guarantees, Participation Rates and Caps, and rather high Spreads. (This avoids the cost of potentially re-filing the product in the event that market conditions decline, forcing the insurer to dramatically lower rates.) Often, salespeople are surprised when they see the maximums and minimums on the pricing levers for Indexed Annuities in particular. From a marketing standpoint, it is important to remember that the insurance companies would most likely discontinue selling the product(s) before rates were ever reduced to these minimums/maximums. 1100 – 1700 B. C. Archeologists reveal that the legal codes of Egypt provide evidence that an annuity was purchased by a Prince ruling in Sint, in the Middle Empire. 1759- A Pennsylvania company offers the first annuity in America to Presbyterian ministers and their families. At the close of 2016, Fixed Annuity sales were $38.7 billion. February 15, 1995—Keyport (now Sun Life) sold the KeyIndex Annuity for a premium of $21,000. Over a 5-year period the annuity grew to a value of $51,779. The average CD at the time would have returned $27,554 over the same five-year period, had the client continually renewed it. At the close of 2016, Indexed Annuities sales were $58.2 billion. 1952- TIAA-CREF sold the first Variable Annuity for use in college and university qualified retirement plans. At the close of 2016, Variable Annuity sales were $104.7 billion. "Wink is our go-to-source when we need information on the annuity and life insurance markets. The Wink gang are the best in the industry – hands down."